The lighthouse that is! It is located at the far left edge of the photo. Does anyone recgonize it or know where it may be located? The photo is from the 1940's. Does anyone recognize this golf course? A clue is that the course may have been located in Michigan. The photo is from the 1930's. 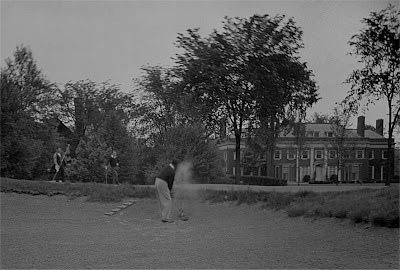 Thanks to MikeM for identifying the golf course as the Country Club of Detroit located in Grosse Pointe Farms, Michigan. The golf course was started in 1897. If you would like to learn more about the Country Club Of Detroit, please click here. Does anyone recognize this fine Federal style house? The two flagpoles may provide a clue that the house served in a municipal capacity when the photo was taken. The photo is from the 1940's. Does anyone recognize this beautiful Victorian house? 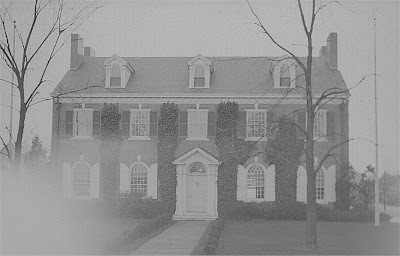 The house may have been located along the East Coast, possibly New Jersey. The photo is from the 1940's. Research indicates that this is the Neosho National Fish Hatchery located in Neosho, Missouri. The hatchery was established in 1888 and is the oldest federal fish hatchery in operation today. 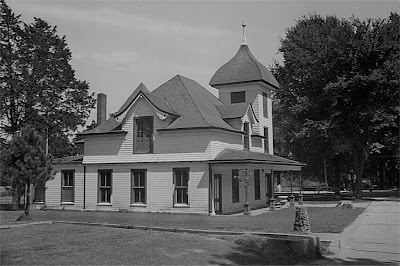 The building in the photograph is the original hatching house, which was built in 1890.